To move around or magnify a diagram, you can pan or zoom. Open the diagram for viewing or editing. For more information, see View, create, and edit a diagram in Visio Online. Zoom in and out of the drawing using the slider in the lower-right corner. To fit the diagram page to the current window, select Fit page to current window . Open the diagram for viewing. 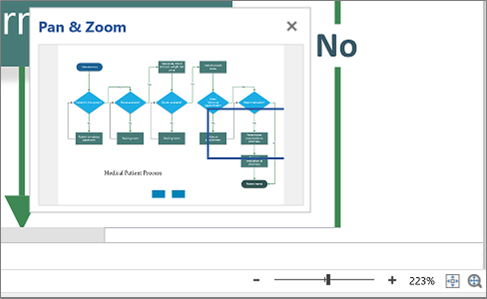 For more information, see View, create, and edit a diagram in Visio Online. To display the Pan & Zoom window, select Show the Pan & Zoom window . A blue box indicates the region of the page that is shown in the drawing window. If you do not see a blue box, drag inside the Pan & Zoom window to create one. To pan, move the blue box. To zoom, draw a blue box.